Santa has known me from my radio days for many years and gave me permission to write a fun little story. 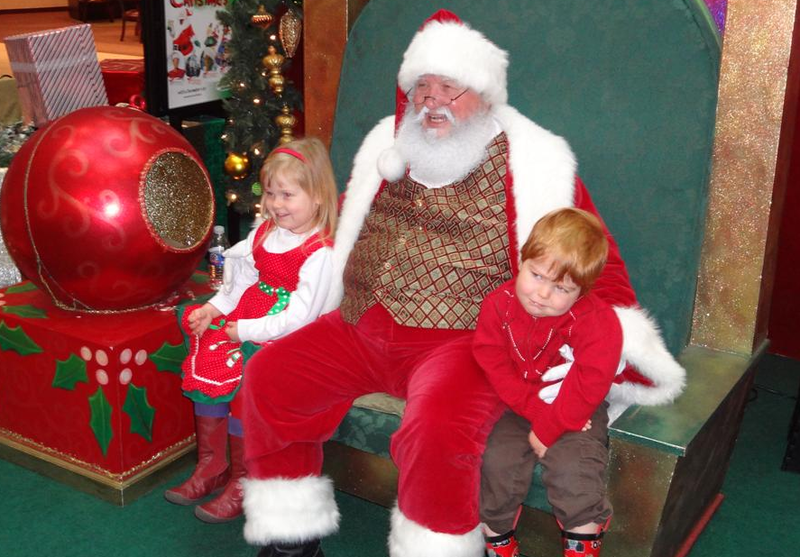 On a recent trip to Northgate Mall, I caught up with Santa Claus and had the chance to ask him a few brief questions. For the past 16 years, it has been our family tradition to gather at the mall Christmas Eve morning for pictures with the Head Elf, Cinnabons and some last minute gift buying. Me: How long have you been playing Santa Claus? Santa: Santa Claus doesn't "play". Christmas is serious business. Me: I mean, how long have you been coming to Northgate Mall to take pictures with the children? Santa: Since it opened in April of 1950. You do realize it was one of the first post-war, suburban mall-type shopping centers in the United States. Me: Do you prefer Uber or Lyft? Santa: I prefer my sleigh and 8, not counting Rudolph, tiny reindeer. Me: Then where are your Reindeer? Santa: Ho Ho Ho! Up on the roof top of course. Me: Do you mind if I tug on your beard to make sure it's real? Santa: Why no, not at...ouch! Me: When you're not delivering toys Christmas Eve, what do you like to do? Santa: Nap, golf, supervise the toy making, nap, eat and then sometimes I work out. Me: What is your favorite kind of cookie. Santa: The ones that children leave out for me on Christmas Eve. Me: I've often wondered when you come to my house, why you only take a bite of a cookie, instead of eating the whole thing. Santa: No offense, but you don't make very good cookies. Me: Why is your suit red? Santa: I'm an Alabama fan. Roll Tide! Me: Santa, every time we come to the mall you always say "Hello! Rockfish" and you always remember my wife and my children's names. I have trouble remembering where I put my car keys. How do you have such a great memory. Santa: I take plenty of vitamin B-12, ginkgo biloba, and omega-3 fatty acids. Me: What is your favorite holiday movie? Santa: Anything I've starred in. Me: Final question Santa. Am I on the Naughty or Nice list this year? Santa: You do realize I see all your Facebook posts right? Santa: Ho ho Ho,...Merry Christmas!